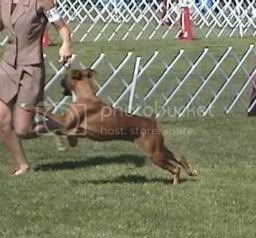 Well ,I took Edy to her first real show this weekend . She placed 2nd in her class . She behaved better that I expected with the judge , she still wiggled , licked the judge and tried to roll over for a belly rub (but I got her back to paying attention to me) . The judge just laughed and said what a silly little puppy Edy was . That was my biggest fear -that the judge would be upset at the way she wiggles . It was a learning experience , I thought I was calm but when baiting her I noticed my hand shaking . I had a friend watching and she said that I did well handling . Edy jumped when a dog barked at her from outside the ring on her down and back , so I stopped and walked back to begin again . Over all it was a good experience . As I was leaving the ring the judge commented on how nice Edy was and that she will be great one she grows up . .
Gone but never forgotten Mocha , Titan , Charlotte . Awesome job Edy!! Sounds like she did very well for it being her first time in the ring! As I was leaving the ring the judge commented on how nice Edy was and that she will be great one she grows up . That's a great comment; I usually get they'll be good once they're trained, or once they're with a (competent, is the insinuation) handler. NewCastle that is a great pic, very funny. LOL, unfortunately Ca$h was NOT a pup during his big-err, um, incident. He sure has given me a run for the money in his career though, starting with his first match in which he refused to let go of my sweater sleave. someday I'll figure out how to download his well known video. 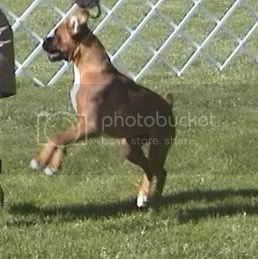 It just wouldn't be right if a pup didn't wiggle and have fun in the ring. That sounds like a fabulous debut - not too much tomfoolery or nerves, and some very good comments! Way to Go Edy !!!! Congrats! Glad to hear Edy behaved better than expected. And received such a nice comment from the judge as well! However, I'd rather have a puppy bounce around the ring than do what DB was doing in the photo Jennifer linked to! That boy is such a goof! !